one of the orignal doors! 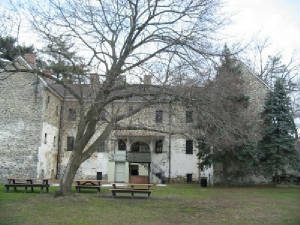 When the prison was originally designed, each “guest” of Burlington County was to have his own cell with a fireplace and a narrow window placed above eye level. The Rules of the Jail directed that prisoners were to be bathed, deloused, and have their clothing fumigated and that each cell should have a bible or prayer book “to improve the soul.” Individual cells, intended for felons or criminals, were arranged in sets of four, opening off a short hall at each end of the building. These “blocks” of cells were to house separate groups, i.e. habitual criminals, first offenders, and women. The larger rooms on the main hallways were to accommodate the debtors, imprisoned for owing money. These were common rooms, sometimes holding three or four men at a time. During the day debtors were to be allowed to move about the jail, working at various cleaning chores or employed in the basement workshop. The “dungeon” or maximum-security cell, was in the center of the top floor. That location was carefully chosen to prevent escape by digging, to minimize communication with criminals in the cell blocks, and to ensure constant surveillance by guards making rounds. This was the only cell without a fireplace. 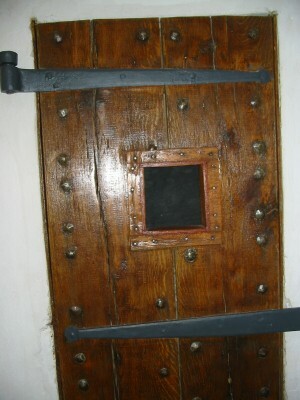 It is flanked by niches for guards or visitors and has one very high, very small window and an iron ring in the center of the floor to which the prisoner could be chained. As one might expect, tradition states that this cell is haunted. Supposedly, the ghost of Joel Clough, a murderer who spent his last night there, has paid tribute to his last earthly residence and to the vigilance of the prison guards in later years. Originally, two rooms on the main floor were set aside as living quarters for the “Keeper” and his wife. The Keeper's wife was expected to supervise the female inmates and the Keeper was to execute the “Rules of the Jail” as devised by the Prison Board composed of members of the freeholders. The Keeper and his family lived in these quarters until the adjacent brick house, connected by a passageway, was constructed on the corner of Grant and High Streets. 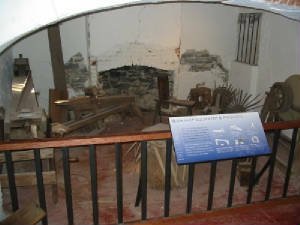 In keeping with the intent designed into the structure, the basement level contained a workshop where prisoners were expected to learn some useful trade - how to make brooms, baskets, or shingles. Another, less supervised pastime of the inmates that endured through the ages was prisoner graffiti. Depicting humor, despair and a belated piety, several fine examples of this art have been photo-conserved and are on display throughout the building. 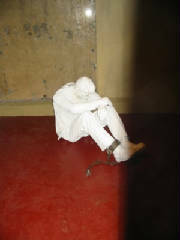 The felons' eating room, also in the basement, permitted controlled access to the exercise yard with its twenty-foot wall. Outside, prisoners could tend a small garden of fresh vegetables. In one corner of the yard there was a set of leg stocks to punish unruly inmates, and an area was set aside for the gallows which were dismantled and stored between hangings. Staple foods, linens, cleaning supplies and craft materials were stored in the basement near the kitchen, baking and washing facilities. Once a day the prisoners were to be served a main meal of meat and vegetables. The other two meals were usually cooked cereals or grains. They had milk and cider to drink, as well as water. Until 1928 the prisoners prepared their own meals. One of the inmates was made chief cook and slept in a basement cell next to the kitchen. Large wash tubs provided for laundry and regular baths for the prisoners. CLICK 4 "SYMPATHY 4 THE DEVIL"